To mark #IVD2018 we're sharing the results of our first volunteer experience survey and saying thank you to our amazing volunteers! International Volunteer Day is a chance to celebrate the efforts of volunteers and the focus for 2018 is how volunteers can build resilient communities. The majority of our volunteers are involved in their local community - organising support group meetings or fundraising activity; representing us at events; sharing our award-winning information and running local Life your Life workshops. In fact all of our volunteer roles make a huge impact in bringing communities together. From our reader panel, advisory group and healthcare professional volunteers to buddies, office volunteers and trustees – your time is enormously valuable in enabling us to reach people across the UK and ensure they are not facing lymphoma alone. We’re extremely grateful for your support! 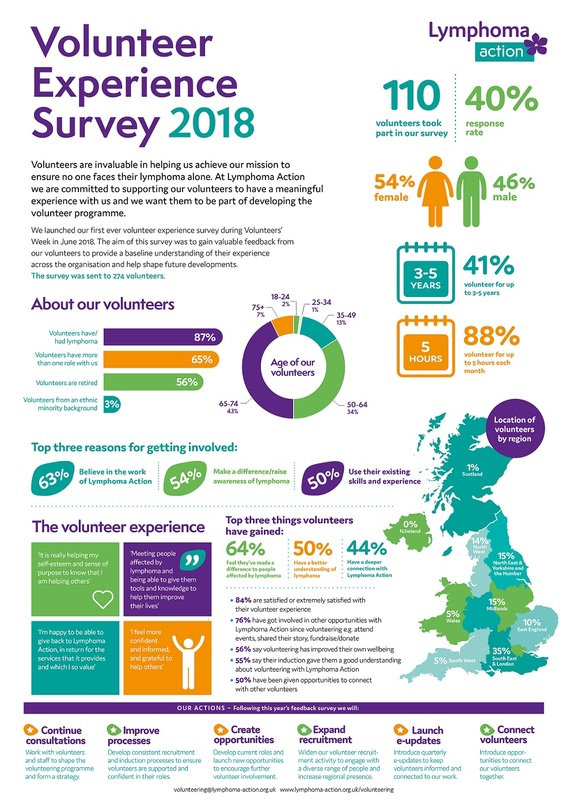 To mark #IVD2018, we're sharing the results of our first volunteer experience survey which we launched back in June to provide a baseline understanding and shape future developments. A HUGE thank you to the 110 volunteers who responded – your feedback is so important to us. That’s why we’ve committed to taking action in specific areas that will develop our volunteering programme further (shown at the bottom of the image below). Watch this space for updates! If you’d like to join our community of volunteers, check out our opportunities and how you can register your interest.